Dr. Adish C. Aggarwala is a Senior Advocate and the Chairman of All India Bar Association, Former Vice-Chairman of Bar Council of India, Former Chairman of Bar Council of Delhi, Former Vice Chairman Bar Council of Delhi, Former Senior Additional Advocate General of Govt. of Haryana, Former Additional Advocate General of Govt. of Punjab, Govt. of Uttar Pradesh and Govt. of Tamil Nadu and Former Vice-President of Supreme Court Bar Association. The PIL filed by Mr. Adish Aggarwala against present Kerala Governor and former Chief Justice of India P Sathasivam has gained wide media attention. Justice Sathasivam had participated in a conference organised by Mr. Aggarwala in the Star Cruize Ship in Singapore, Malaysia and Thailand from February 28, 2010 to March 3, 2010. Justice Sathasivam had also participated in the releasing function of book authored by Mr. Adish Aggarwala and had written an appreciation to the book. In this Interview Mr. Adish Aggarwala speaks about many things including the background on which he filed the petition against Sathasivam. Live Law : You have approached the Supreme Court alleging that NDA Govt is going to appoint Kerala Governor P. Sathasivam as NHRC Chairman. What is the basis for such anticipation? Can you elaborate it? Dr. Adish C. Aggarwala : The news of his proposed appointment has appeared in different newspapers including Deccan Herald dated 26.3.2015. It was stated in the report that the Government has obtained his consent to become the Chairperson of NHRC. The Times of India dated 16.4.2015 also published the news regarding his consent. Neither Justice Sathasivam nor the Govt. of India denied the correctness of the said assertion about having sought his consent. It is an open secret that Ms. Rashmi Goel, Joint Secretary (Human Rights), Ministry of Home Affairs has spoken to Justice Sathasivam and Justice Sathasivam himself informed her that he is very keen to act as Chairperson of National Human Rights Commission as he is not happy with the post of Governor. Justice Sathasivam is also learnt to have told her that he has already requested the ‘higher-ups’ for the said position since it is a quasi-judicial post. Live Law : There is no confirmation from official sources regarding the appointment of NHRC Chairman, if so, is it not a premature petition? Dr. Adish C. Aggarwala : The writ petition is not premature. The petition would have been premature had it challenged the appointment which has not taken place. The petition is not directed against the appointment of any single person, but is aimed at the assailing the process of appointment on the ground of lack of transparency, of favouritism (adoption of pick and choose), of lack of inquiry into probity of the candidates, of consideration of a person who has been rendered ineligible by supervening events. Also, once the appointment takes place, the damage to the institution is already done and the only effective recourse, which would also avoid embarrassment to any person, is to raise the issue prior to completion of the process of appointment. By obtaining consent, which Ms. Rashmi Goel, Joint Secretary (Human Rights) Ministry of Home Affairs, must have recorded in the concerned file, it is clear that the process of appointment of NHRC chairperson has been initiated. I am challenging the selection process. The government cannot deny that they have initiated the process of appointment. It is unbelievable that a Joint Secretary would, of her own, telephonically talk to a Governor for his future employment without knowledge and authority of the Government. Had the process of appointment been initiated by her in her individual capacity, she would have obtained the consent of all eligible candidates, which includes Justice R.M. Lodha, Justice Altamas Kabir and Justice S.H. Kapadia. These former Chief Justices are not facing any accusation and have an impeccable record. Yet, the Government, chose to ignore them and initiated the process after having already selected the candidate. In a forum where it is the act of the Government which will be under the scanner, the Government cannot be allowed to choose the presiding officer as per its whims. This would be akin to allowing an accused to choose his judge. There has to be a fair and robust selection process and consent of all eligible persons should be obtained. Then their candidature must be evaluated by the selection committee in a transparent manner. Not following this process and randomly trying to appoint a person as the Chairperson may be aimed at sending a message to the judiciary that they should appease the political establishment for post-retiral positions. The integrity of the institution of Supreme Court cannot be allowed to be compromised. Live Law : Sir, you were known as a person who was very close to Mr. Sathasivam, he had participated in many functions organised by you, He had also participated in a Conference organised by you in a ‘cruise ship’ while he was the Chief Justice of India. Can you explain your friendship with Justice Sathasivam? 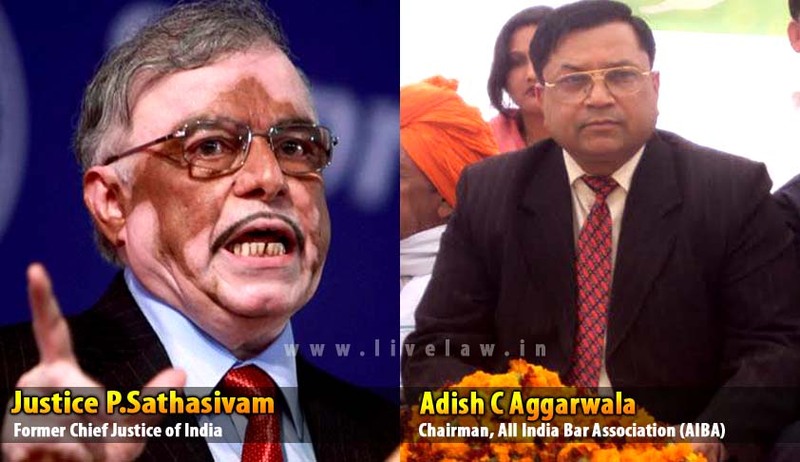 Dr. Adish C. Aggarwala : My association with Justice Sathasivam was professional. He had once contacted me to speak to Justice Balakrishnan for assisting in his elevation to Supreme Court which I declined since this was principally wrong as Justice Karpagavinayagam was senior to him. I was never on friendly with any Hon’ble Judge. In fact, no lawyer can be friend of Judges. The Bar Council of India Rules forbid any lawyer from appearing before his acquaintance judges. I never appeared before Justice Balakrishnan in Supreme Court. It is only when I was elected as Vice-Chairman of the Bar Council of India and also acted as Chairman of the Bar Council of India, that I had the occasion to meet Hon’ble Judges during functions and events held in different Universities / Law schools / Bar Councils and Bar Associations. Justice Sathasivam has attended “International Conference of Jurists on Sea on Global Warming” as a Judge and not as Chief Justice of India. The Government of India had borne the expenses of his and his wife’s travel and stay. Live Law : What are reasons for the breakage of your friendship ? Dr. Adish C. Aggarwala : There was no friendship as stated earlier. He has been known to me earlier as well as today. My petition is not because of straining of relations, but is founded on principles. The National Human Rights Commission is a repository of our values and safeguards human dignity. We must protect the institution from degeneration by the appointment of an unsuitable person at the helm. When he was the Chief Justice of India, Justice Sathasivam wanted to become Lokpal. When other Judges also applied for appointment as Lokpal, and he found his chances to be bleak, he requested me to canvass for his appointment as Governor of Karnataka. I declined to take up the matter because I do not think Judges should take up political appointments post-retirement and such sinecures affect the independence and the dignity of the Judiciary. When it ultimately came to be reported in the press that he is being appointed as Governor of Karnataka, I discussed with other bar leaders and took a decision to oppose the move. Live Law : When it is reported that you had sent letters against the appointment of Sathasivam as Kerala Governor, there is a huge surprise in the legal circles. What was the provocation for you to take such a tough stand? Dr. Adish C. Aggarwala : If one has to pursue higher goals of Constitutionalism, one has to rise above leanings. Our vow is to defend the Constitution and to stand for fairness and transparency. We cannot allow erosion of the institutions that are the pillars of the society. If the watchdog is amenable to influence by the government the entire edifice on which the human rights jurisprudence has been built would fall flat and the perpetrators will go scot free after infractions of the law. Live Law : You have mentioned that you had suggested Mr. Sathasivam not to accept the post of Governor, what was his reaction? Dr. Adish C. Aggarwala : It would not be proper for me to disclose his reaction. However for the reasons underlying his desire to be appointed Governor, you may refer to the letter written by him while serving as CJI to the then Prime Minister. Live Law : Some of the mainstream media had reported that Justice Sathasivam was gifted with Governorship by the NDA Govt. as quid pro quo for quashing the FIR against Amit Shah in the Fake Encounter Case. Recently Sathasivam attended the wedding of Amit Shah’s son. What do you think ? Dr. Adish C. Aggarwala : I do not believe that governorship was gifted as quid pro quo for quashing the FIR against Mr. Amit Shah in the fake encounter case. I was also counsel for an IPS officer from Gujarat in the proceedings before Justice Sathasivam and Justice B.S. Chauhan. I am aware of the facts and I can safely say that the judgment was not a favour to Mr. Amit Shah. The judgment was on merits. Live Law : In an earlier conversation you said that, you had suggested him to try for NHRC chairmanship instead of Governorship. Now you are opposing his NHRC chairmanship. Why? Dr. Adish C. Aggarwala : That time, he was a former CJI. Today, he is a Governor. Having been appointed as Governor once, one has soiled his hands and cannot reclaim the purity of a judge, or to be unapproachable, independent and above all influences. Also, initially, I was not aware that Justice Sathasivam had sought such favours from the Govt. of Tamil Nadu. It is only when my opposition came out in the press that whistleblowers contacted me and I learnt that he had used his influence to get the land released which was already acquired and which was vested with the State. The Madras High Court was very critical of release of land by the State Government of Thiru M. Karunanidhi. I was also earlier not aware that he had used his influence and got Maruti car agency for his son without deposit of security deposit of Rs. 5 crores. Once these facts came in public domain, I did not suggest his appointment as Chairperson of NHRC. Justice Sathasivam would also be aware that unless he purges himself of the taint, he cannot possibly hope for a quasi judicial position and that might have led him to seek gubernatorial assignment. Also for Chairmanship of NHRC or Lokpal, there are three former Chief Justices (and many retired Supreme Court Judges for Lok Pal) whose careers have been without blemish, and since chances of selection of Justice Sathasivam were bleak, he may have canvassed for being appointed Governor. Live Law : You have made very serious allegations against him. Do you have any evidence supporting your allegations? Many of those are pertaining to a period when you and the Mr. Sathasivam were very close. Why you were silent then? Dr. Adish C. Aggarwala : On 29.7.2014, when I wrote a letter to the Prime Minister, I was not aware of those allegations and I simply stated that for preserving the cherished ideals of the Apex Court, its former Chief Justice should not be appointed Governor. After that several persons contacted me and informed me about the favours sought by Justice Sathasivam. That led me to write letters dated 1.9.2014 and 4.9.2014 pointing out the information so that our institutions could be protected from becoming a tool in the hands of persons of dubious integrity. Live Law : Do you think allegations made in the Writ Petition make out a cognizable offence under PC Act? If so, are you planning to file a Criminal case? Dr. Adish C. Aggarwala : No criminal case is made out against Justice Sathasivam but the allegations disclose irregularities and serious impropriety. Moreover as Governor he enjoys immunity from prosecution. The land illegally obtained by Justice Sathasivam for his relative can however be reverted back to the government and for that steps must be initiated by the State Government. Live Law : Why did Justice Sathasivam approach you for lobbying Governorship? Dr. Adish C. Aggarwala : He must have requested every person who he thought could help him in canvassing. He himself also lobbied and indiscriminately used the Tamil Nadu government car for meeting various persons. Live Law : Recently CJI Dattu applauded PM Narendra Modi. Many people including Mr. Dushyant Dave and Justice Katju raised serious objections to it. What do you think? Dr. Adish C. Aggarwala : It is inaccurate that the present Chief Justice of India Justice Dattu had officially applauded Prime Minister Narendra Modi. Needless to state, one is entitled to hold any personal opinion in our democracy and unless the view is shared on an official platform there is no impropriety. It may be noted that every Judge is entitled to vote in general elections. Even the President of India, who is the first citizen and is obliged to act neutrally and is the custodian of the Constitution, casts his vote in the election. These functionaries, like any other citizen, are therefore entitled to hold any personal opinion. It is also correct that Prime Minister Modi has enhanced the status of India throughout the world and is trying to improve the lives of people from all sections of the society. Live Law : Do you agree with the law commission’s suggestions that there must be a two years’ Cooling Off period for retired judges before accepting any post retirement jobs? Dr. Adish C. Aggarwala : In my opinion, there should no provision for grant of sinecures or post-retirement posts for judges. We have proposed to the Government to increase the age of retirement by three years and also to increase the number of judges. Sitting judges may be deputed for tribunals and commissions, except commission under the Commission of Inquiry Act. This is the only way to secure independence of judiciary. Otherwise politicians will try to influence judges by offering post-retirement positions. The provision of two-years’ cooling period is not an effective remedy against the lure of such positions.